Unfortunbately it seems he will not remain with the leafs fo now. But still a great inspiration for many of the young Muslims around Canada who love hockey so much. The number of hungry people has passed a record one billion this year at the same time that food aid is at a 20-year low, the United Nations World Food Programme said Wednesday in London. The number of undernourished people in the world has grown largely due to higher food prices, according to the agency. The organization is facing a serious shortfall so far, having confirmed only $2.6 billion in funding for its 2009 budget of $6.7 billion, it said in a statement. “This comes at a time of great vulnerability for the hungry,” the agency said. About 65 per cent of the world’s hungry live in only seven countries: India, China, the Democratic Republic of Congo, Bangladesh, Indonesia, Pakistan and Ethiopia, according to the agency. Maya Market – 197 Norice St.
New Middle East Supermarket – 1755 Bank St.
Mattar Food Market – 1656 Bank St.
Ottawa Main Mosque – 251 Northwestern Ave.
What: Film screening: The Furthest Mosque (25 minutes). What: Multifaith Panel Discussion on Equality for Women (Muslim, Unitarian, Christian, Jewish and Buddhist speakers). What: Live demo presentation on Forensic Science by Mahmoud Abed, forensic scientist RCMP, Co-chair of RCMP HQ National Advisory Committee for Visible Minorities. Ramadan is upon us. We have a very few number of days left before this blessed annual guest arrives. Preparation for this month’s treasures have already begun. Muslim grocers have stocked up with the regular Ramadan delights; Mosques, centers, and organizations are preparing to host iftars for the masses; and groups are planning for their nightly devotions at their favourite Masjid. All are abuzz leading up to the Month of Quran. Yet, something remains amiss. The culture surrounding Ramadan, since as far back as I can remember, is very much the very attitude many of us hold towards many of the quasi-religious and secular holidays and festivities that surround us; materialistic consumerism. It seems as though this month that teaches us about simplicity and humility, has lost that flavour. It seems as though, in order to taste the sweetness of Ramadan, we must indulge in tasting all sorts of sweets. From kulfi, to Baklawa. From gulab jamun, to knafa. We’ve simply lost the essence of minimalism and conservation that is one of the lessons Ramadan was intended to teach us. So here are a few tips to make our Ramadan, and all our work a little bit more down to earth. There are a number of areas in which we can make our Ramadan have the same healing effect on the Earth as it would to our souls. After all it is the Month of Quran. Lets take a little bit of time to renew our commitment to the responsibility Allah has entrusted us with. The trust and responsibility of being representatives of Allah, and managers of this Earth. Pay heed to the verses reminding us of our place on this earth and our duty towards in and it’s inhabitants, from people to animals; from plants to the inanimate resources that are the bounties Allah has blessed us with. Furthermore, I can’t imagine a better way to implement the the command of Allah to ponder his creation than by going out into the natural environments that so abundantly surrounds our city to explore the beauty of Allah’s creation and the might of His design, subhanah. I would say a beautiful habit to perhaps develop this Ramadan, that would also be a practice of the Prophet Mohammed’s tradition of seeking solitude in the outskirts of Makkah to worship and ponder upon Allah’s miracles. It’s true there is much ethnic diversity within Islam and that along with that come diverse cultural traditions of food and drink. This in turn provides for a beautifully colourful array of deserts, and foods on the iftar spread. This i’m not about to critisize since I certainly enjoy my occasional ludu (waxy yellow ball). What I’m proposing is try to use local ingredients in your embarrassingly named “Ramadan Recipes”. Instead of using imported chickpea flour, use local produce. Instead of imported (and increadibly expensive) dairy products, consider Ontario dairy. This will help reduce your ecological footprint, and insha’Allah with the proper intention perhaps help you increase your foot print in Jannah. While devoting our nights to prayer, and our days to remembrance of Allah and the study of the Quran we needn’t help the fat cats at the energy company milk more money out of our Mousques, Schools and centers. Use the light of the sun shining through the windows to read the Quran, and try prayeing in the dark or at least in low light. YOu’d be surprised what that can do for you in terms of increased tranquility and concentration (khushou’). Especially praying in the dark, giving an increased sense of solitude with your creator. Maybe this Ramadan climate change watchers may see a dent in the trends of emmisions due to energy use. The same applies to our use of water. We could really do with the revival of some of the forgotten sunnan (traditions) of the prophet peace be upon him when it comes to the use of very little water in our ablution. Even though we live on the banks of the Ottawa river, consider the reminder the beloved gave his companion to conserve water even if at flowing river. I believe that applies very appropriately for us in Ottawa specifically and in Canada generally with one of the most abundant freshwater resources at our expense. With all the iftars going on around town, and the huge numbers of people in i’tikaf in the Masajid just take a second to think about the amount of waste produced from disposable plates and cutlery, not to mention the enormous pile of PETE water bottles. I cant imagine it very difficult for masajid to invest in some reusable plates and cutlery. I mean we did it at our MSA at the University of Ottawa, and we all pitched in cleaning up afterwards. Perhaps, with these tips we may not only be able to give our bodies a rest of all the food, along with the toxins we inadvertedly consume, we give our Mother Earth the rest she deserves from all the toxic, hurtful, wasteful habits we’ve plagued her with. This way she may leave us with more places to pray upon that will vouch for us on the day of recompense. Muslim Coordinating Council Youth is having an event at the Main Mosque this Friday called “Lifting the Veil – A discussion on youth identity” from 6 to 7pm. The price is a can of food for sadaqa food bank. Protected: Local Wins Writing Award + Obama Pick Quits + Fisrt Sisters’ Mall + Really? 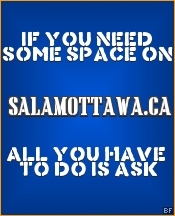 August 11, 2009 at 4:56 pm	Salam Ottawa Team	Enter your password to view comments. The 99 – Comic Book Series to makes a joint comic with DC. The 99 Joins forces with the Justice League. Movies based on Marvel Comics. Movies based on DC comics.